I've been invited to produce a series of workshops and murals in Derry, Northern Ireland by the the Playhouse International Culture Arts Network (ICAN) and What IF? Project. The idea is to utilize graffiti as a tool for social change. to create murals throughout the city. and painting the mural in the city center. Next week the workshops will also incorporate djing, parkour, and graffiti. This August, the Playhouse International Culture Arts Network (ICAN) and What IF? 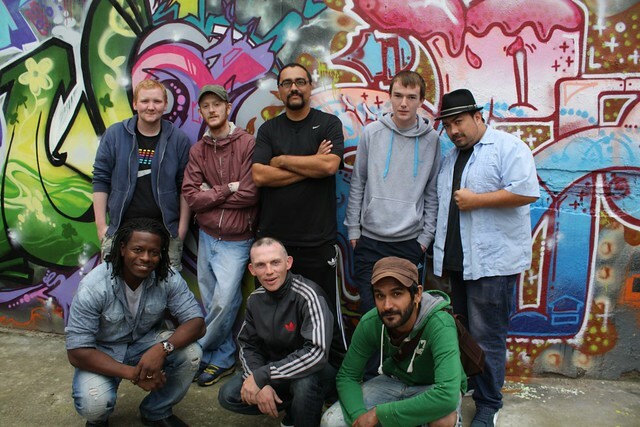 Project will bring international graffiti & mural artists to the North West. These artists will collaborate with local graffiti artists, share their expertise with local practitioners and work with young people living in interface communities of Derry-Londonderry and Moville, County Donegal. The international artists Man One, Pablo Cristi, Ernel Martinez and Sidd Joag will lead a master-class in Graffiti & Mural Art on Wednesday 3rd, Thursday 4th and Friday 5th August 1pm – 5pm. The masterclass participants will have the opportunity to paint Free Derry Corner on Friday August 5. This class is open to all including artists, facilitators, educationalists and activists who are interested in learning graffiti skills at the same time as developing ways of using art for positive social change. This master-class is free. The final week of the Urban Arts Project 15th – 19th August 11am – 3pm will enable young people to participate in graffiti workshops as well as DJing and parkour. This week will be youth-led, giving the young people the opportunity to collaborate with an international and local team of artists. If you want to participate in either the master class (Wednesday 3, Thursday 4 and Friday 5 August, 1-5pm) or the Youth Art Project, (from Monday 15 to Friday 19 August, 11am-3pm) or further information contact Elaine Forde on 02871 268027 or elaine@derryplayhouse.co.uk. ICAN is a three year project which has been part-financed by the European Union’s Regional Development fund through EU Programme for Peace and Reconciliation (PEACE III) managed through Special EU Programmes Body.